The project is simple and straight forward. Melissa used laminated cotton for the first time. 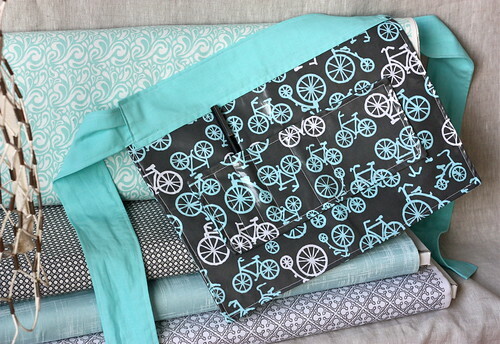 For help getting started with Laminate, she used Kathy’s Laminated Cotton Sewing Tips (http://pinkchalkstudio.com/blog/2009/11/18/laminated-cotton-sewing-tips/). Melissa made the child’s large size. The only issue Melissa had was that the waist band was a little short when she went to attach it to the main panel. After some investigation she realized the apron piece was cut long with the intent of trimming later. The apron ended up about 1 inch wider than instructed. 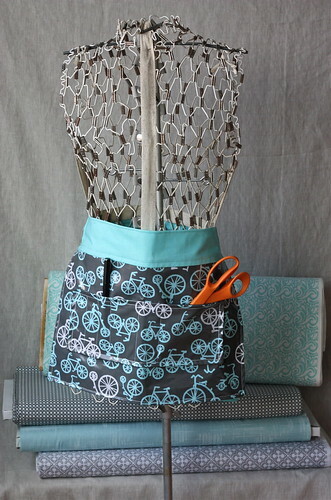 Since the apron ended up bigger than intended, Melissa made the ties 5 inches longer and the pocket 5.5 inches tall. Alterations Melissa would make for the child size large, 1) Make the pocket a little bigger (maybe 3 inches taller and 2 inches wider), 2)Use one or two seams on the pocket to give two or three larger pockets. 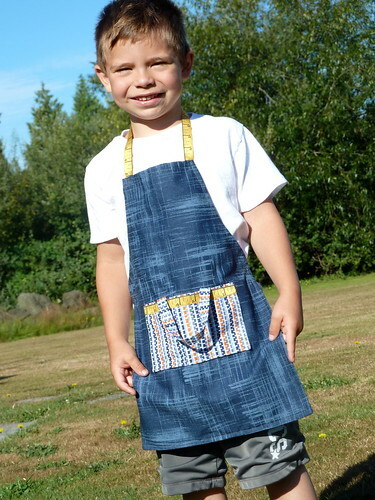 The pockets, the size they are in the pattern, would be great for the toddler size apron. Diana loved the Craft Apron project! 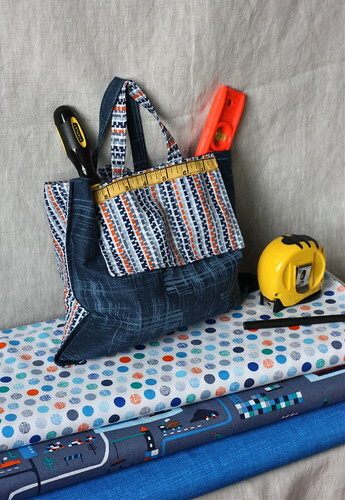 The multi functional project is an apron, tool belt and a tote bag. 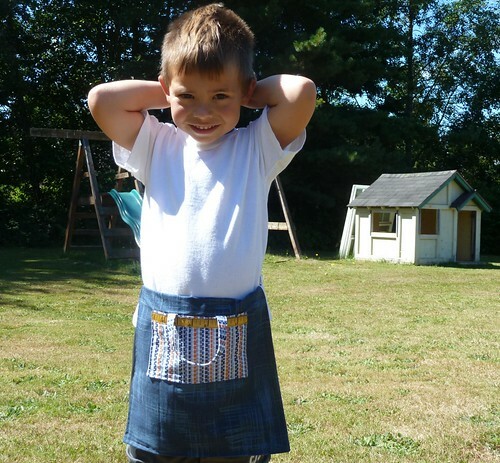 Graham can wear the apron as a tool belt. Now he can help Dad get things done around the house. The pattern calls for a very clever casing on the sides. As written, one ribbon goes thru the casing to form the neck hole and the ties. Diana simply attached the ribbon to the neck and used a different ribbon for the ties. The sides of the apron were folded over and stitched down. The Tape Measure Ribbon from the Ribbon Jar, adds a fun and useful element!